Written with a watercolor palette as ink source. I've got a new practice list to share! I've actually been using it for awhile now and it's become my default warm-up list that I've memorized. 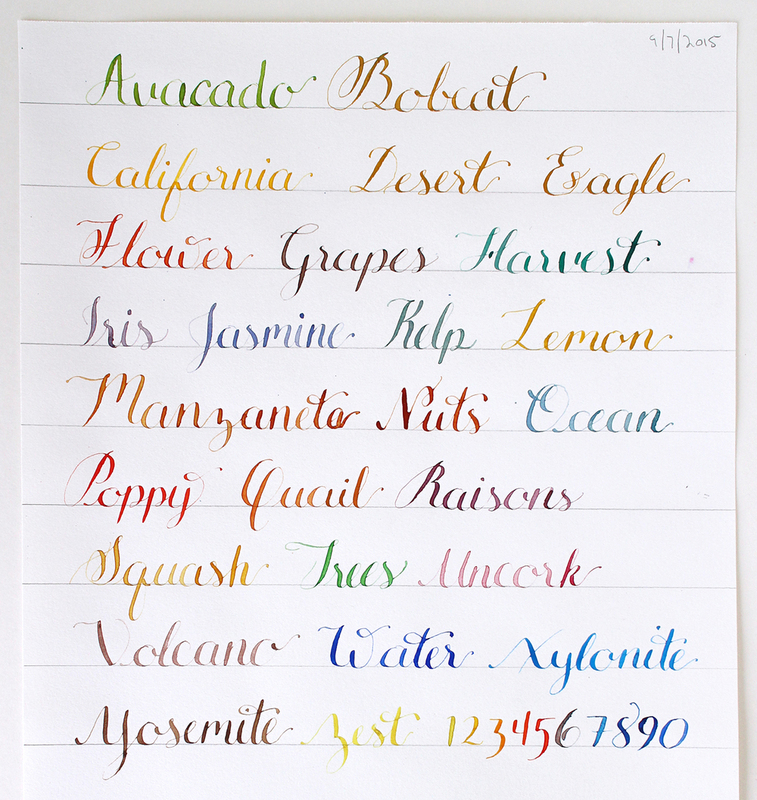 Unlike the list I've used to compare my progress learning calligraphy it's easier to practice all the minuscule letters by just writing the list as Title Case. There is of course a word starting with each letter of the alphabet but also nearly every letter is accounted for within the body of the words. The two exceptions are the letters X and J. It's tough enough to find words that begin with X. As for the J, that was tough to find while fitting with the California theme I was going for. Luckily a minuscule 'y' holds the same properties as a 'j'. Testing out a few different nibs. Testing a new ink and practicing with an oblique nib holder. One little note about the green practice sheet above. I wrote it with an oblique nib holder! That exclamation point is needed because for over two years I've only used a straight nib holder. 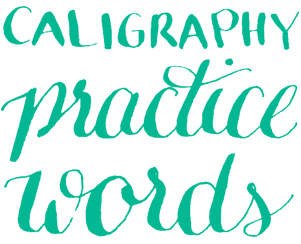 Straight is the tool I learned to write calligraphy with and I assumed it would feel weird to use the oblique. Then a couple weeks ago I took a flourishing class which must be done with the oblique. I was surprised to find it feels pretty easy to go back and forth between the different nib holders. Now for the full California inspired list for easy copying and google searching. This is also the moment when I realize how much I've been spelling wrong on my practice sheets. Avocado, Bobcat, California, Desert, Eagle, Flower, Grapes, Harvest, Iris, Jasmine, Kelp, Lemon, Manzanita, Nuts, Ocean, Poppy, Quail, Raisons, Squash, Trees, Uncork, Volcano, Water, Xylonite (yes, this one is a stretch), Yosemite, Zest. Remember I share these practice lists so you can get to practicing all the letters without having to think of something new to write. They're not meant for imitating the letterforms themselves as I am also still learning and these are just evidence of my own practice. Posted in Calligraphy and tagged with practice words, practice lists, watercolor. October 7, 2015 by Shasta Garcia.